IntoSport's football legends section features Stanley Matthews print memorabilia in addition to a wide range of football legends photos and canvas prints. 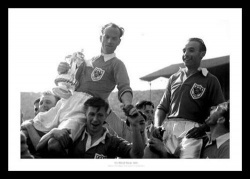 Stanley Matthews is regarded as one of football's greatest players. Matthews played until he was 50 years old, but only played for two clubs - Stoke City and Blackpool FC. He is particularly remembered for his performance for Blackpool in the 1953 FA Cup final, a final that has since been named 'The Matthews Final' . Stanley Matthews also played 54 times for England, and in two World Cups. 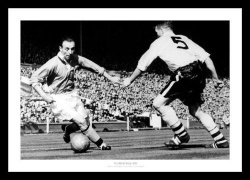 Our Stanley Matthews prints are available in a range of print sizes and can be bought as photo only as well as ready framed. We are also able to offer all our photographs on canvas up to a super large size of 24x16 inches.